Lately I've been getting into debates over the "engdogeneity of money." This is one of those perennial debates in the econosphere that will never be resolved, has taken on oddly ideological proportions, and really has no practical significance for economics or the real world. Nevertheless, duty calls. Here's the background: If you've ever taken an introductory macroeconomics course, then at some point you were told that the central bank (Federal Reserve if you live in the US) controls the money supply, and that it manipulates interest rates and output by changing the money supply. The "endogenous money" critique is that the although the Federal Reserve can create money, so too can private businesses, and in particular private banks, by fractional reserve banking. For those who are not familiar, this is because each dollar created by the federal reserve gets lent out several times, each time entitling a different person a claim to a dollar's worth of liquid reserves. So in effect, the "total" money supply is equal to the total number of claims to liquid reserves, which roughly equals the money that the fed creates plus the amount of loans by private banks (there are a few other potential sources of money creation besides bank loans and the Fed, however). This is a point that both the mainstream and the endogenous money views agree upon. Now here's the disagreement: the mainstream view is that even though the private sector does create money, the Fed still controls the total amount of money in the economy. The endogenous money view is that because private firms can create money, the total amount of money is determined by firm profit maximization, not the Fed. So essentially, the mainstream school says that monetary policy is effective, while the endogenous money school says that monetary policy has little-to-no macroeconomic effects. The point that I keep trying to make, however, is that the disagreement between the endogenous money school and the mainstream is mostly superficial, and that they actually agree on the points that count. Lets go back to private sector profit maximization. Firms create money because households desire--for whatever reason--to hold part of their financial wealth in the form of money. The amount of wealth that people want to hold in the form of money is money demand. Money demand depends on the interest rate, because the alternative to holding wealth in the form of money is holding it in the form of interest-bearing assets, like stocks and bonds. Intuitively, if the interest rate was really high, then people would rather invest their money than keep it in their wallet in case they want to buy a coffee, but if the interest rate is really low, then they won't mind having some cash on hand for that incidental purchase. Now suppose that firms are trying to figure out the amount of money supply they need to create to maximize profits. If they produce more money than households want to hold at a given interest rate, then some of their product will sit unused, which does the firm no good. If they create less than the housholds want to hold at that interest rate, then they missed out on a profitable opportunity. So firms will produce exactly enough money so that money supply equals money demand at the prevailing interest rate. But here's the caveat: the interest rate is controlled by the federal reserve. This is a point that both schools of thought agree upon. First, we've already noted that the Fed can create and destroy money directly, and that money demand depends on the interest rate So provided that private firms do not counteract the Fed's money creation/destruction operations, this will lead to changes in the interest rate. We know that at any given interest rate, firm profit maximization leads to money demand and money supply being equal. Second, if direct money creation/destruction by the Fed is being counteracted by money creation by private firms, then the Fed can influence the interest rate by lending to banks directly. The Fed can choose whatever interest rate it wants to lend at, and as long as this rate is less than or equal to the interest rate the bank can get by lending the money out, they will do so. Competition ensures that the market equilibrium interest rate will fall until it equals the rate the Fed is paying. 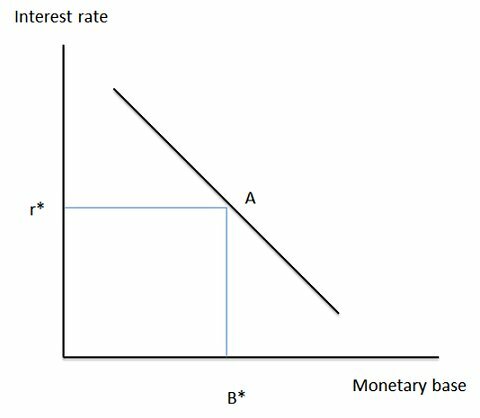 Since money demand depends on the interest rate, and at any interest rate profit maximiztion ensures demand and supply are equal, this means that the Fed can control the supply of money by choosing the interest rate at which it lends. Finally, the opportunity cost for a bank to lend out its money is the interest it can earn on reserves, which set by the Fed. That means that the interest rate that banks lends at has to be greater than or equal to the interest rate the Fed pays on reserves. That, in turn, implies that the total amount that banks can lend is constrained by money demand, which is the amount of money households are willing to hold at a given interest rate. Thus, because at any interest rate profit maximization implies demand equals supply, the Fed can control the money supply by choosing the right interest rate to pay on reserves. Now, the monetary base is the amount of money created by the federal reserve, not necessarily the money supply as a whole. The distinction actually doesn't matter since the money demand can be expressed as either demand for money in general or demand specifically for monetary base (which is equal to total reserves). But even if you don't like that argument, then just imagine that instead of monetary base, the x-axis says money supply instead of monetary base. If the Fed controls the interest rate, then we can draw two lines and find out what the money supply will be, and visa versa. Why does all this matter? Because if the Fed controls the interest rate, then monetary policy can be used to smooth out the business cycle. Otherwise, it cant. Are there ever times when the Fed can't control the interest rate? Absolutely! For example, when nominal interest rates hit zero, the Fed is no longer able to lower interest rates any further (or can they?) giving rise to a unique economic environment known as a liquidity trap. We've been in this situation twice in the past century: the first time was the Great Depression of 1929-1939, and the second time was the Great Recession of 2007-present.